During the first two years of the project, the team will develop an updated conceptual model of the CLAS, which will lead to initial estimates of major water budget components such as recharge, surface water groundwater exchange, and coastal discharge. The conceptual modeling process will also include development of initial model input datasets. These datasets will be derived from a variety of sources, including remotely sensed datasets and outputs from other models. These independent estimates of important water budget components will not only provide important, early insights into the groundwater available within the CLAS, but will also be used in construction of the groundwater model datasets, conditioning of the model to historical data, and for quantifying the uncertainty of system properties and water-budget components. In contrast to more traditional modeling, the CLAS model will be developed within an uncertainty quantification (UQ) framework using recently-developed USGS tools, PEST++ and pyEMU. Within this framework, we will formally and rigorously define the uncertainty in the model throughout the model development process. The uncertainty of the quantities of interest (QOIs) of the predictive models will also be quantified so that these predictions can be understood in the context of a range of plausible results. 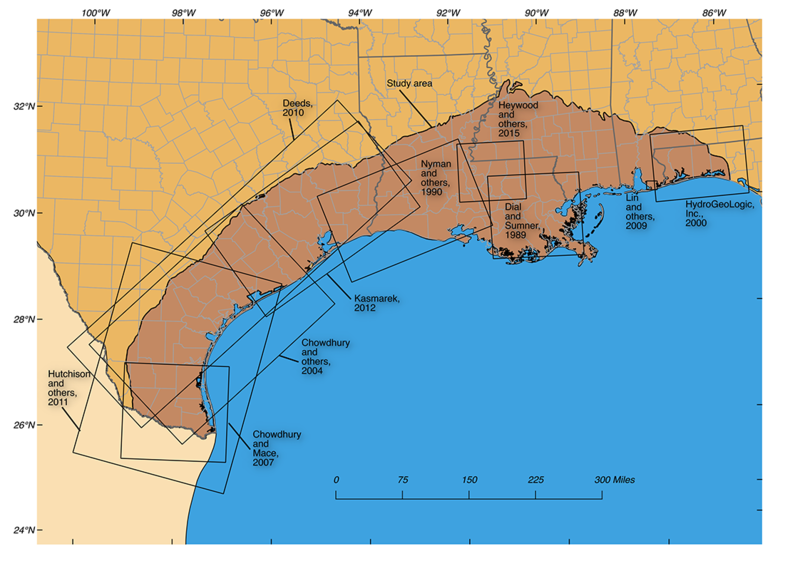 Land-surface subsidence is a major issue in the CLAS study area, most notably within the Houston-Galveston Texas region, as well as in Baton Rouge, Louisiana. In the Houston-Galveston region, water-level data from wells have been collected and analyzed annually to create water-level altitude and change maps since 1977. The simulation of subsidence will be implemented through the new subsidence package for MODFLOW6, which is being developed as a part of this study.